One day late last August, a netted enclosure near Washington’s Cypress Island collapsed, releasing tens of thousands of non-native Atlantic salmon into Puget Sound. Coastal tribes and state officials were not informed about Cooke Aquaculture’s spill, the cause of which is still under investigation, for several days. But once alerted, coastal tribes, including the Swinomish, Samish and Lummi, asked licensed tribal fishermen to capture the non-native species, which they feared could imperil native salmon. The Lummi Nation was most responsive to the spill; it declared a state of emergency and caught more than 43,500 of an estimated 160,000 escapees, selling them back to Cooke, which disposed of them. Some caught upwards of 7,000 pounds per day on their boats. For years, the Lummi Nation has protected the native salmon runs that fuel its shelangen, or way of life, and that play an important role in the tribe’s economy. 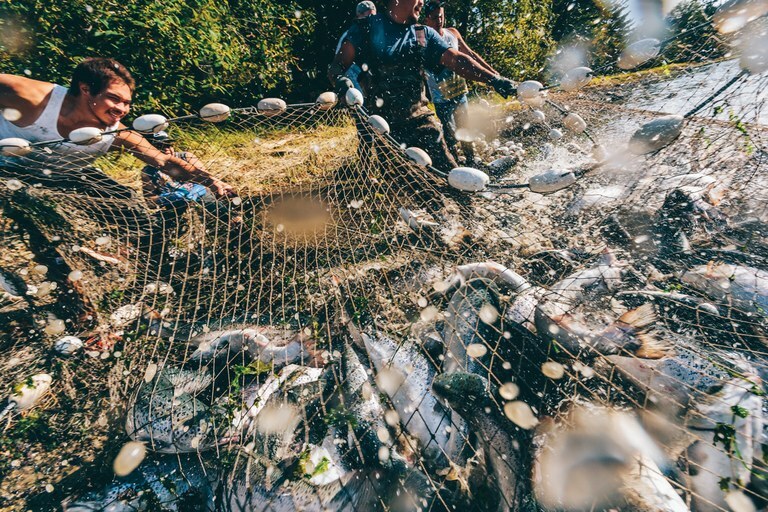 Now, the tribe must grapple with the ecological and political consequences of one of the region’s largest farmed salmon spills, amid renewed debate around Pacific Northwest aquaculture. Lummi Nation fishermen capture non-native Atlantic salmon that escaped a Cooke Aquaculture pen Aug. 21, 2017 outside of Cypress Island. The full ecological impacts of the spill are yet to be determined. According to Cooke Aquaculture, the recaptured Atlantic salmon had empty stomachs, suggesting they did not compete with native fish for food, and because they were not yet sexually mature, they did not breed with native stocks. One major worry remains, though: the possible spread of disease. Canadian studies have found that farmed salmon harm wild and hatchery salmon through sea lice and viruses, but whether the spill has caused any diseases won’t be known until the juveniles return from the ocean as adult salmon in four years. In the meantime, the tribe has done everything it can. It refused Cooke’s offer of increased payment for recaptured Atlantic salmon — $42 a fish instead of $30 — in exchange for an agreement that the Lummi would not advocate for a phase-out or ban of net-pen aquaculture, an offer Ballew called “insulting.” Instead, the Lummi offered a resolution at the Affiliated Tribes of Northwest Indians’ fall conference, calling on Northwest states and the federal government to ban non-native saltwater finfish aquaculture. Cooke also offered the tribe $1.3 million to help recovery efforts, but tribal officials say that underestimates the long-term costs. Washington state has also responded. Gov. Jay Inslee, D, in August issued a moratorium on new net-pen leases, and Democratic state Sen. Kevin Ranker says he plans to sponsor legislation next year to eliminate Atlantic net-pen farms by 2025. The farming practice is currently banned in Alaska, and effectively prohibited in California. The spill also raises bigger questions over tribal treaty rights — and how far they extend offshore. An 1855 treaty and the 1974 Boldt Decision gave the Lummi the right to hunt and gather in their accustomed territories and the right to half the annual fish runs, and made them co-managers of fishing seasons and hatchery programs. But off-reservation boundary water rights have yet to be significantly tested in the courts, and the Lummi have limited say over commercial operations in the Puget Sound. Instead, Washington state manages the waters, leasing areas to companies like Cooke Aquaculture. A review of Cooke’s net-pen leases and sites is underway, Washington Department of Natural Resources spokesperson Cori Simmons said, and so far one lease has been revoked. Meanwhile, the agency’s head, Hilary Franz, has directed it to work more collaboratively with tribes.